The payment was in relation to an incident that took place at Pearse Station in 2013. File photo of Pearse Station. 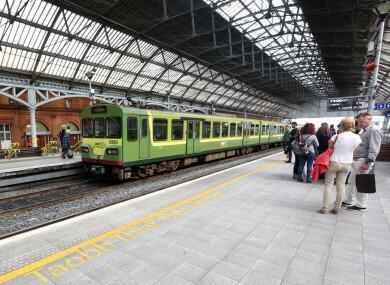 IRISH RAIL WAS guilty of having made “unwarranted slurs” in court against a 26-year-old marketing executive who had sued them for assault and false imprisonment, a judge in the Circuit Civil Court said today. Judge Francis Comerford said the company had used “unattractive comments” posted on Twitter by Sarah Doupe to establish she was a violent and crude person who had abused members of staff at Pearse Dart Station on the night of the 2013 Trinity Ball. “This was a line deliberately taken by the defence which was not made out and compounded the harm done to the plaintiff by the false imprisonment on the night,” Judge Comerford said. Comerford ordered Irish Rail to pay Doupe €16,000 in damages for false imprisonment over an incident that occurred at Pearse Station on 5 April, 2013. The court heard that Doupe, of Maryville, Skerries Road, Lusk, Co Dublin, although she was not going to the ball, was among a crowd of black-tie revellers who stepped off a packed Dart train at Pearse Station on the night in question into the middle of a dispute over tickets. Although she had a ticket she had become involved in an altercation with Irish Rail staff member Darren Williams who had fined a man who did not have a ticket. This man had then shouted abuse at Williams. Judge Comerford said that when she was refused Williams’ name, Doupe had reached for his identity badge on a lanyard around his neck and, she claimed, had been pushed backwards by him. She had taken a photograph of Williams on her phone and had refused to delete it. Then as she attempted to leave the station a number of staff and security men had been instructed to and did detain her on the ramp. Doupe denied in court that she had abused Williams or that she had threatened to bite him. Judge Comerford told Doupe’s barrister Fergal Fitzgerald Doyle that he was accepting she had been detained because she had refused to delete the photograph and had been held until the arrival of gardaí a few minutes later. He dismissed her claim of assault. The judge, in a significant reserved judgment, said Irish Rail employees dealing with late night crowds, as well as bus and taxi drivers, nightclub bouncers, gardaí and staff at A&E Departments were subject to abuse ranging from offensive comment to very grave assault and Irish Rail had advertised it would not tolerate abuse of staff, clearly a laudable policy. Williams was complying with company policy in issuing the man with a fine when he became involved in the altercation with Doupe who wanted to know his name. She was in no way intoxicated, abusive or out of control, as alleged by Irish Rail and had she been given Mr Williams’ name she most likely would have left but instead took the photograph of him, the judge said. “Gardaí, parking wardens or security staff would have legitimate concern about being photographed and would have a desire that any photographs taken of them while engaged in their work would be deleted,” Judge Comerford said. He said it was a real concern that such photographs would be bandied about on social media with hurtful and insulting comments and clearly Williams thought wrongly that once the guards arrived the picture would be deleted. “We have to bow to the realisation that none of us have any right not to be photographed in a public place… a feature that has become more pronounced now that so many people carry a camera in their phone,” the judge said. He said a law stopping the taking of photographs in public places would engender more problems than it would cause and a prohibition by Irish Rail against photographs being taken in their stations would be a very bad rule if introduced and would give an impression of a cloak being drawn over fault. “I am of the view that a law restricting the use of photographs by disseminating them without consent of the subject for the purpose of causing harm or embarrassment would be a far better and more workable rule than one which barred the taking of photographs in a public place,” Judge Comerford said. He was satisfied Doupe had been detained because she had taken the photograph and that Williams had not been adequately identified to her. A difficult to remember identity number had been given to Doupe but he felt hiding a name carried tinges of something that was discreditable or needed to be hidden. Awarding Ms Doupe €16,000 damages for false imprisonment, Judge Comerford said if there was a policy of keeping identities confidential there had to be a system allowing a member of the public to be able to identify the person they were dealing with. Mr Fitzgerald Doyle, who appeared with Pavel Abramov of John Kilroy Solicitors, was awarded costs against Irish Rail. Email “Irish Rail ordered to pay €16,000 for false imprisonment of passenger”. Feedback on “Irish Rail ordered to pay €16,000 for false imprisonment of passenger”.